Our decades of experience with rubber diaphragms makes ERIKS capable of designing and developing specific rubber parts, often in close cooperation with the customer. Rubber diaphragms that help you solve any sealing problem in the world. ERIKS offers infinite possibilities, whether rubber diaphragms need (fabric) reinforcement or to be bonded to PTFE for chemical resistance. Typical applications for our diaphragms (like pumps and valves) are in process control, water management, food and beverages processing, gas regulators, and other industrial systems. Where required, a rubber prototype can be made so that the product can be tested in practice. It could first start with producing A 3D-printed “fit & feel” sample within hours. Production of the rubber moulded equivalent can be produced also on very short notice in one of the prototype production cells at ERIKS. The eventual definitive rubber product can be supplied in very small to very large series. In our own laboratories we develop any material required, whether that is on cleanness for Semicon applications or special material approvals and compliances for food or pharmaceutical applications. The moulding of rubber and elastomeric compounds is accomplished by forcing the uncured material into a shape using heat and pressure. Rubber and elastomers can be moulded by compression, transfer and injection methods. The volume of parts and type of rubber compounds required will determine the moulding method used. Our engineers participate with you in developing innovative solutions for the production of your rubber moulded parts. 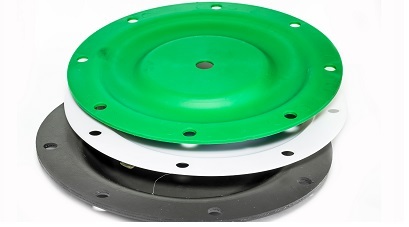 ERIKS designs and develops innovative solutions in custom moulded rubber diaphragms. With our worldwide partners we offer fast delivery, competitive prices and engineering support. Our in-house material knowledge, CAD/CAM and FEA analysis and quality systems guarantee an individual approach.